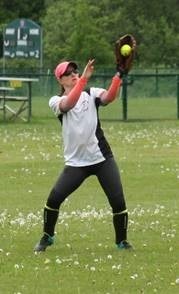 The first all-female tournament of the year took place on Sunday May 13th under blue sunny skies at Farnham Park. 10 teams ranging from Solent, to Lakenheath including 4 teams made up of the ladies from 4 of the clubs in the Windsor League, took part. The teams were divided into two groups of 5 playing out a round-robin. Group 1 containing the reigning CWS Cup winners, No Balls, saw the all the teams being a little inconsistent with everyone beating each other. The current holders looked to be in trouble when they lost their 2nd game of the day and their qualification into the Cup was in the balance right up to the last game. It took an edgy 8-6 win in their final game against Pitches Be Crazy to top the group by a solitary run and avoid a potential clash with last year’s runners up and previous winners, LadyHeath. Group 2 was an extremely hard-fought group by all teams, and up to the last game any two of the top 3 teams could have all qualified for the Cup. Tropi-gal Twisters had lead the group from round 1, Chavs and LadyHeath had vied for second spot. Into the final game, a LadyHeath win would put them through, Chavs had to win otherwise they would miss out. Tropi-gals need to match Ladyheath’s result to win the group. In the end the Tropi-gal Twisters unfortunately lost out right at the end following a defeat by Chavs and a Ladyheath win over Cleats and Cleavage. The group was that close, that 1st ended up 3rd with just one loss in the group phase. Group two also saw the Scorch-Hers, not only score a run this time out, but also win a game. They had the mis-fortune to go through the 2017 event without a run or a win. They are now on the board and took their place in the Plate competition for real. The bottom team in each group played out their own Spoon final, this year that was between Cleats and Cleavage and RG Blue Sox, with Cleats and Cleavage taking the honours. The Plate semi-finals saw the Tropi-gal Twisters again miss out, as they fell to the Diamond Squeezers. Blitches halted Scorch-Hers winning run in the other semi. The Cup semi-final saw No Balls beat Chavs to set up a final against Pitches Be Crazy who defeated last years runners up, LadyHeath. 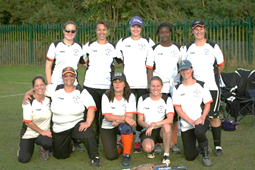 The finals saw Blitches over come Diamond Squeezers to win the Plate competition in their first outing in a female event as a club. The main final saw No Balls retain their title beating Pitches be Crazy. The team from Solent were the first team other than No Balls or Ladyheath to reach this stage, which was a huge step forward for the girls from the south coast. This was the third running of C.W.S and each year the level has risen. The group stages this year were the most keenly fought of all and while No Balls have reached the final each time, the other teams are certainly catching them. A third straight win is not a foregone conclusion when C.W.S 4 returns in 2019. 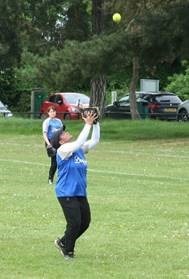 This entry was posted in C.W.S, Diamond Squeezers, Tournaments and tagged CWS, Female, Softball, Tournaments on May 17, 2018 by maidenheadsoftballclub.